Over the past four months, the breakaway Republic of Kosovo has received diplomatic recognition from two more U.N. member countries. The self-proclaimed southeastern European country now claims recognition from 101 U.N. member countries (52%), up from 99 in our previous Kosovo recognition update (see "Disputed Recognitions" below for details on why the total has only been incremented by two). 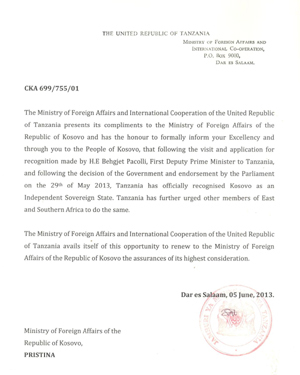 Tanzania, a republic in East Africa, recognized Kosovo at the end of May, and nearby Egypt extended its recognition a month later (just days before the breakout of its current constitutional crisis). Yemen had already endorsed Kosovo's independence earlier in June, and the small Central American country of El Salvador apparently followed suit by the end of the month. The Republic of Kosovo declared independence from Serbia in 2008, but has been blocked from U.N. membership by objections from Serbia, Russia, and other countries who see its secession as invalid. In addition to the 101 U.N. members from whom Kosovo claims recognition, its independence is also acknowledged by non-U.N. member Taiwan. For more on Kosovo's special situation, see our first Kosovo recognition report, which also includes a map of Kosovo's location relative to Serbia. As explained in our previous Kosovo recognition report, there has been doubt cast on some of Kosovo's claimed recognitions. In fact, if the Kosovan government's past disputed claims of recognition are included, the total number of U.N. member countries recognizing the breakaway state is now 103. However, a recent report from Kosovo's foreign ministry only claims 101 U.N. member recognitions, even while acknowledging the four most recent additions. This suggests they may finally have given up on the questionable claims of recognition from Nigeria and Uganda (the third disputed recognition, from São Tomé and Príncipe, is better documented). In any case, the total number of countries recognizing Kosovo now forms over half of the U.N. membership even without counting disputed recognitions. Stay Up to Date: Check for further updates to this story by viewing all Kosovo articles on Political Geography Now.